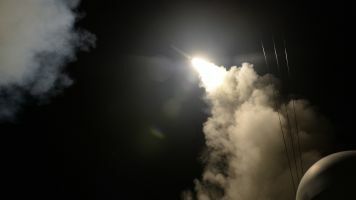 Russia's foreign minister warned the U.S. against launching a second missile strike against Syria. Secretary of State Rex Tillerson's visit to Moscow got off to a heated start Wednesday when his Russian counterpart warned the U.S. shouldn't retaliate against Russia's ally Syria. This warning comes on the heels of a chemical weapons attack earlier this month that killed more than 80 people in Syria. The Trump administration says Syrian President Bashar al-Assad ordered the attack. The U.S. responded by firing almost 60 Tomahawk missiles at a Syrian air base days later. After the U.S. fired missiles, Tillerson said Russia was either "complicit" in the chemical attack or "simply incompetent" at preventing it. Currently, Russian armed forces stationed in Syria are backing Assad and his allies in a civil war against opposition groups. Russian President Vladimir Putin says Syria doesn't have chemical weapons and condemned the U.S. strike as "an act of aggression." While meeting with Tillerson in Moscow, Russian Foreign Minister Sergey Lavrov said a second U.S. strike cannot happen. He also criticized U.S. foreign policy, calling it "ambiguous" and "contradictory." Tillerson took a more diplomatic approach and said it was important for both countries to state their positions and understand where they differed. While Tillerson is in Moscow, he's also meeting with Putin.